The site of National Center of Photography was originally the Taipei Branch of Osaka Shosen Kaisha. 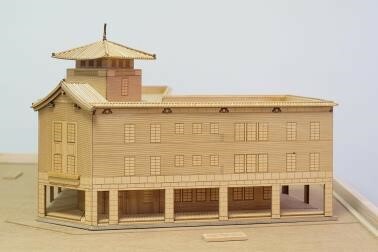 It is the only work known in Taiwan by the renowned Japanese architect Watanabe Setsu. The construction started in 1937. It is a three-story building of reinforced concrete in simple modernism. A traditional oriental-style tower was placed at the northwest corner, which reflects the trend at that time. This is one of the last reinforced concrete buildings in Taiwan under Japanese rule before the island entered the period of supply control during the war. The building is representative and rare that witnessed the era. The beam-column and floor were constructed according to a high standard of earthquake resistance. The works of Watanabe Setsu include Nippon Kangyo Bank head office in Tokyo, Industrial Bank of Japan head office in Tokyo, Nihon Mengyo Club, Kobe Stock Exchange and branches of Osaka Shosen Kaisha etc. Osaka Shosen Kaisha was founded in 1884. It was a famous transport company in Japan. 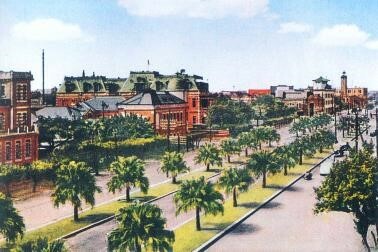 In 1896, the route traveling from Keelung to Kobe, passing Okinawa was started, subsidized by Taiwan Governor's Office. Except for Taipei, offices were set up at Keelung, Tainan and Kaohsiung. In 1964, Mitsui Steamship Company Limited merged with Mitsui O.S.K. Lines Limited and became Mitsui O.S.K. Lines that is known today. This building was taken over by Taiwan Navigation Company after WWII and was renamed Tai Hang building. In 1958, Taiwan Navigation Company switched offices with Taiwan Provincial Highway Bureau. Motor Vehicles Office, Administration Office, Office of General Affairs, Library and Meeting Room were located on the first floor. Cross-Island Highway Construction Division and Maintenance Office were located on the second floor and Operation Office, Secretary Office and Director's Office can be found on the third floor. The Highway Bureau built a new 9-floor building at its eastside in 1968, tearing down the tower and added the fourth floor. Later, yellow-brown erding bricks were hung on the exterior wall as it is today. Taiwan Provincial Highway Bureau came under the Ministry of Transportation and Communications. In 2002, the name was changed as Directorate General of Highways, Taiwan Provincial Highway Bureau. In 2013, it moved to a new building at Dongyuan Street, Wanhua District. The building was given to the Ministry of Culture to be the National Center of Photography by National Property Administration. 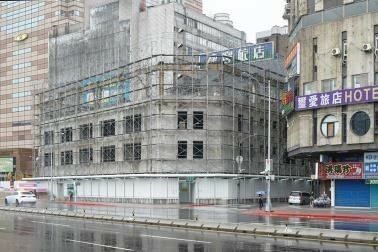 The Bureau of Cultural Heritage and Taiwan National Museum will be in charge for restoration and management. The building should be restored to what it was in 1937 and the interior should be designed to meet the need of exhibition and photography display. Due to its great location near Taipei Main Station and Taiwan National Museum, the Center is expected to be the highlight of Zhongxiao West Road and within the museum system in Taipei Old Town. 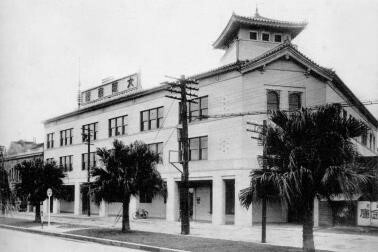 Started from 1937, the building was the office of Taipei Branch of Osaka Shosen Kaisha till 1946 and was taken over by Taiwan Navigation Company. In 1958, Taiwan Provincial Highway Bureau came. It has undergone many reconstructions. The Bureau of Cultural Heritage started the business of renovation of historical site in 2014. In 2015, the Cultural Heritage Committee of the competent authority, Department of Cultural Affairs of Taipei City Government, pass the plan of renovation. The building should be restored to what it was in 1937 and serve as National Center of Photography. It's expected to be done and open in 2019.